Preheat oven to 375 degrees. In a medium sized mixing bowl, combine cream cheese, diced tomatoes, mayonnaise, Parmesan cheese, garlic and fresh basil. Stir in chopped artichoke hearts and spinach. Taste mixture and adjust seasoning with lemon juice, kosher salt and fresh ground pepper. Set stuffing mixture aside. Rinse the whole tomatoes under cold running water and pat dry with clean paper towels. Slice off the top of each tomato with a serrated knife. Using a spoon, scoop out 1/3 of the insides of the tomato. Fill the tomatoes back up with the stuffing mixture. 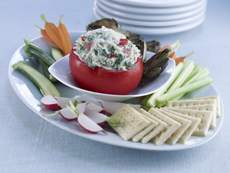 Top each stuffed tomato with the shredded mozzarella. Place stuffed tomatoes in a baking dish and put them into the pre heated oven. Bake for 10 to 15 minutes or until bubbly and golden brown. Remove from oven and let cool slightly. Serve warm with tortilla chips or crisp flatbreads. *To seed – Cut the tomato in half. Squeeze each half to loosen seeds and then carry on with dicing or whatever you intend.